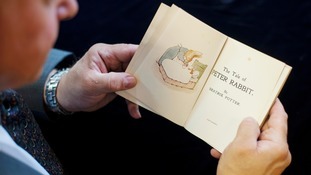 The special Beatrix Potter coin he was given have been selling online for more than £600. The adorable 10-stamp issue marks the 150th anniversary of Potter's birth. Featuring Peter Rabbit, Jemima Puddle-Duck, Tom Kitten and more! A previously unseen story written by children's author Beatrix Potter more than 100 years ago will be published in September.